I discovered Vivica's blog quite recently through a post on Foodgawker: It was her fabulously looking Low-carb Zabaglione With Meringues which also happens to be a great option for fat fast. Vivica is a food photographer with interest in nutrition and follows a healthy keto / paleo diet like me! 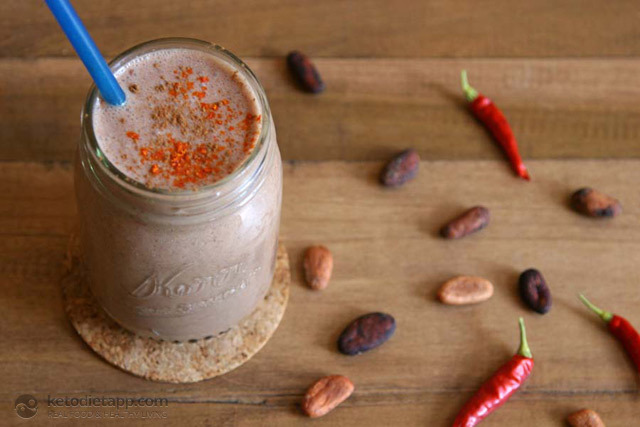 I'm sure you'll love her Keto Mexican Chocolate Shake. 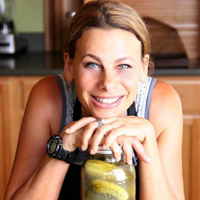 Make sure you visit Vivica's blog for even more amazing recipes! I am very pleased to have Vivica guest-posting for my blog and it has also helped me with my time management. This week has been really busy for me, as I've been working on the next big release of KetoDiet Apps. If everything goes well, we should be able to submit a new update within the next 2-3 weeks. Now, back to Vivica's recipe! Are you feeling like your morning needs a little spicing up? If you are like me and can not deal with coffee, this chocolate shake might just be the thing! 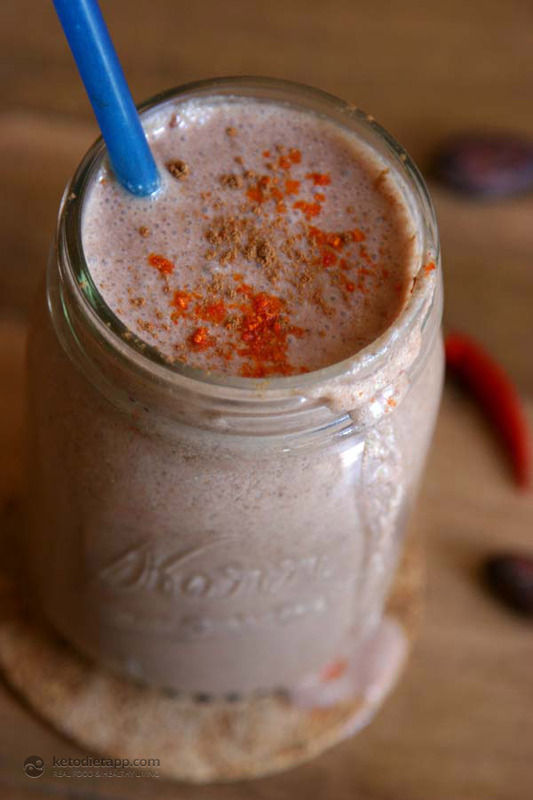 This delicious shake will provide you with 85% fat and the great health benefits of spices like cayenne and cinnamon and cocoa. I hope this works for you . Let me know what you think! Ok Cocoa powder still contains caffeine, about 68 mg per ounce (28 g). Our serving of 2 tablespoons (10 g) in the shake equals about 25 mg of caffeine per serving. Compared to our regular cup of coffee with 95 mg is not quite as bad! Bottom line this is a great way to start your day, full of nutrients, low in carbs and with our desired amount of good fats! Mix all the ingredients in a blender on high for about 1 minute. I was born in Italy, at a time when small grocery stores still existed. I grew up buying veggies at the “verduriere” and meat at the “macellaio”. For the first 6 years of my life my parents had a restaurant and hotel in a small resort in the mountains of Northern Italy. There I spent a lot of time playing in the kitchen, and in the pantries. I visited herds of cows out on pasture and drank fresh milk, and ate cheese made over a wood fire. Those memories shaped my future taste and understanding of food in a deep manner. I left Italy at 19. Lived in Germany for 5 years then in Spain. I moved to California in the early nineties, and decided to become a photographer, a food photographer! Working for national and local magazines gave me the chance to visit (and try) many amazing restaurants. I ate and photographed my way around Los Angeles. Then for 10 years I lived between LA and Brasil, changed career, opened a new business. But in the meantime I was always around food, helping my chef friends with catering jobs, cooking, taking pictures. In 2009 I moved to Northern California with my husband, cats and dog. This has been the move that closed the circle. I am back in the landscape of my childhood, mountains and pine trees! For the last 3 years I have been realizing an old dream of living self-sufficiency. Growing my own food, being connected to Nature and the Earth. My passion for food and the desire to help others has also found its ultimate calling: Nutrition. I am now certified as a Technician in Whole Food Nutrition. I work with Dr. Deborah Penner at Chico Creek Wellness and study for my Clinician certification. YUM! This is delicious, thank you! Thank you!! Thank you!!! Thank you!!! I'm allergic to bananas and avocados. Every smoothie or healthy drink recipe I come across has both. I really can't wait to try this. I have a question, what is coconut cream? Is it like half and half but from coconut? Hi Jan, you can either use coconut milk / cream or heavy whipping cream. I've added a link to where you can get coconut cream from. I personally like a product called Aroy-D (pure coconut milk with just coconut and water, no additives). Another yummy sounding recipe using chia seeds! I am intrigued! Will pick some up and try the shake for Martina's 30-day challenge. And will check out Vivica's blog too. Thanks! Thanks for the delicious recipe. I made this this morning and it was quick, good for you and yum! I can't believe these prior comments. They are so snarky, not even a thanks, just holier than thou and mean. Anyway, I didn't have coconut cream, so I used 1/2 cup coconut milk, and 3/4 cup water. I love the kick of the cayenne. 3 ice cubes was perfect for me. Thanks so much! You might want to be careful using a "supplement" like that! Since it is not monitored by anyone it also tends to be high in heavy metals, lead, arsenic and others. It can. Actually make you sicker than you are to start with. I was using it till I did more investigating, then I decided dying of lead poisoning wasn't worth it. Even with whole beans they can still be toxic. Just an FYI. Cocoa powder has cacao butter removed and is no longer chocolate. This is more of a coconut milk product. Try drinking cocoa powder and water alone. It tastes like garbage. Try drinking true chocolate and you can never go back. I use pure cacao from from Navitas Naturals. I found it on the internet Amazon.com. This is wonderful!! Yum! I love that there are no sweeteners  Thank you Vivica! Are you using the RIGHT "cinnamon" for combating insulin resistance? Ordinary grocery store cinnamon won't do it--it has to be Ceylon or Sri Lanka cinnamon. The stuff sold in grocery stores isn't even cinnamon--it's cassia. Cassia won't make a dent in blood sugar. If buying supplements, always read the ingredient label to make sure you're getting Ceylon or Sri Lanka and not cassia--it costs more, but it's the stuff that actually works! Hi Wenchypoo, I've been using cinnamon from Ceylon and I really like it. The taste is also better than the regular one found in stores. It costs slightly more but lasts for ages!